Mama Mzungu: Has the Balance Bike Robbed Us of Something Important? Has the Balance Bike Robbed Us of Something Important? The balance bike. It’s the latest craze. Or, more likely it’s the craze from 10 years ago that I’m just catching on to. And even more likely it was the craze 100 years ago that the rest of the world is rediscovering. 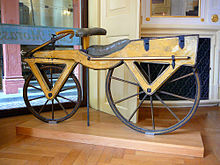 This proto-balance bike, circa 1817, was called a "Dandy Horse." A Dandy Horse!! You can't make this stuff up. For the uninitiated, the balance bike is a small bike with no pedals, chain or training wheels. The child kind of pushes the bike along with his feet and, when comfortable, lets go and balances, coasts and even leans into turns. So, the hard part of riding a bike – the balancing – is mastered before pedals even factor into it. The idea is that when pedals are eventually introduced, it’s a quick and easy leap to riding a bike, no training wheels necessary. 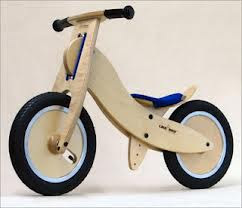 Anyhow, I’m guessing balance bikes are currently a big parenting trend because: (1) these things often come in trendy wooden models and everyone knows that parents who love their children buy wooden toys and (2) because these things really work! My son, who is not exactly the kind of kid to dive head first into things, rode his make-shift balance bike (we just took the pedals and chains off the regular bike) for the better part of a year. 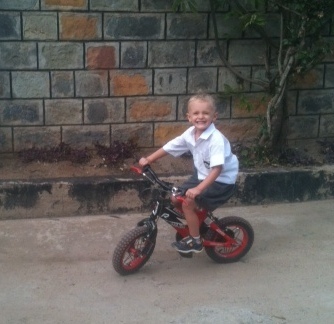 Then, one day at a friend’s house he jumped on a pedal bike (normal bikes are now called “pedal bikes.” Pay attention. ), and he immediately started riding as if he’d been doing it for years. No transition at all. The same thing happened with my sister’s son (also 4 years old at the time) when he jumped on a pedal bike after a year on a balance bike. As as happened with countless other kids, as I understand. I'm biased here, but I can't tell what is cuter: the bike riding, the intense smiling or the crisp school uniform. Last night as the sun descended in the pre-dinner hour, we looked on proudly as our 4-year-old son rode triumphant circles around the compound. We marveled at his ability and stopped to remembered our own first independent pedal of a bike. We were older than Caleb (about 7 or 8) and, not having the advantage of the balance bike, relied on our parents to teach us. We started out wobbly and unsure, dad holding on to the back of the bike and finally setting us free, encouraging us with a “You can do it!” We weren’t so sure, and the ground looked hard and far away. But slowly our dad’s faith in us seeped in, we held our breath, pedaled and found our stride! We looked back at our fathers and yelled proudly and a bit incredulously, “Look at me!! I’m doing it!! !” Or it was something like that. But looking at Caleb completely proficient all on his own, Colin turned to me and said, “It’s kind of anti-climactic, no? I mean the balance bike did all the work.” And with that, our joy turned to melancholy. There would be no “letting go of the bike” as our child peddled on - that archetypal parenting moment. We would miss out on that quintessential struggle between holding our child up and letting him go free, between support and faith. We wouldn’t swallow a lump in our throat being there for that beautiful moment where doubt transforms into self-confidence. And we wouldn’t have that foundational moment we’d look back on to guide us at each subsequent “letting go” time: first day of school, graduation, marriage. We don't have a balance bike, but at times I've thought it would have been a great thing to get. But I'm sentimental, too - that moment watching my first learn to ride was a really memorable moment. And yet, as you say, there will be plenty of memorable moments and more "letting go's" than we as mommas want! Scoff not at the ipad, lest the ipad in turn scoff at thee, when in a weak moment on a long trip (usually a car ride), you say OH JUST PLAY WITH THE IPAD. Which is also a kind of letting go moment (values, principles, moral fiber). My girls have a balance bike and they are definitely ready for pedal bikes (but my pocketbook is not). I'm so looking forward to seeing them with pedals and I'm hoping that when I do see them pedaling away without me running behind I'll appreciate how much that balance bike has saved my back! What a commendable work you have done by posting such blog here about the bicycle part like wheels etc, with simplest of language. I can’t resist myself to leave a comment and trust me it’s hard to impress me.